The New Rules of War: Victory in the Age of Durable Disorder. Sean McFate. New York, NY: William Morrow, 2019. 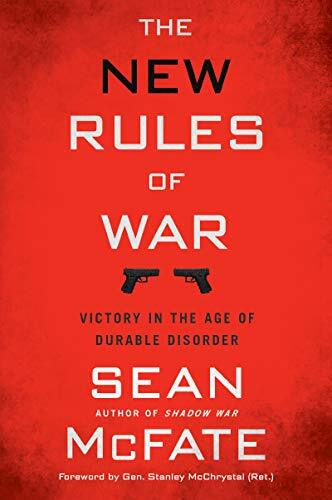 Sean McFate’s latest, The New Rules of War: Victory in the Age of Durable Disorder, is a worthy polemic that walks the line between insight and bombast to mixed results. McFate, using an enigmatic style that evokes Sun-Tzu, offers readers a diagnosis and a prescription, and he excels at exposing uncritical assumptions animating most thinking about the future of war and its practice. Here there is some real insight. Clearly naming problems is important, and McFate does this well. The ten rules pitch at real problems such as fighting with and against mercenaries, supporting or exploiting a fatiguing international order, and adapting to conflict with groups of persons that do not share a Western commitment to the social primacy of states. The rules are worth reading, because they offer a quick and challenging outline that vividly describes these problems. Those who can, as I did, see themselves reflected in McFate’s synopsis of the intellectual groupthink and Washington consensus will benefit from his argument. The diagnosis is often spot on. The diagnosis takes the form of two familiar messages about the future of warfare and the shortcomings of Western approaches within that future. His ten rules form the prescription he argues will remedy the shortcomings and enable victory in future warfare, discussing the diagnosis in terms of entropy and apathy. He argues that the coming global state will be one of “durable disorder.” The threats here are familiar. A failing Westphalian order, revisionist national powers, growing private military powers, and smoldering ancient grievances are creating global entropy. The rule-based liberal order is collapsing into one where war is the norm rather than the exception. Compounding this entropy is the Western (read Washington’s technocratic elite) strategic apathy. The failings here are familiar as well. The West, led by the United States, relies on technology, firepower, and the ever-elusive decisive battle that won wars in the past, but cannot deal with the conflicts it will face in the future. The new conditions of durable disorder require adaptation and the West should adapt before it pays for collective mental apathy in blood. The two familiar messages of entropy and apathy bookend McFate’s rules. Early on, both messages serve to motivate interest in the rules McFate has on offer. At the close of the book, McFate revisits the familiar messages as he applies his ten rules to the 2006 conflict in Lebanon. The messages are familiar, but McFate’s treatment of both is refreshing. The ideas of entropy, apathy, and durable disorder are clear and do not suffer from the bureaucratic opulence that so often plagues other offerings. More refreshing still is McFate’s response to these messages—we should adapt to durable disorder. He rightly pillories the common responses of the Washington consensus as a commitment to more of the same or trying again but just a little harder and with more money. We can agree with McFate on the sickness; we should wonder if the offered cure is snake oil. Prescriptive solutions, however, are McFate’s aim for the ten rules, and on this score I found the book less persuasive. As stated, his rules are not actually rules for action but assumptions one should hold as authoritative when contemplating actions, such as “Conventional War is Dead,” “Hearts and Minds Do Not Matter,” and “There Will Be Wars Without States.” McFate uses most of the book to introduce and argue for his ten rules in turn. These chapters share a similar structure, and one can read each independent of the others. He uses an interesting and vivid description of a problem within the durable disorder, and he extrapolates from this to suggest prescriptive conclusions. Readers should expect, and engage with, the prescriptions at the end of each chapter. Here McFate is usually novel and bold. Many of the prescriptions will be challenging for career professionals to consider, but careful readers will not mistake the novelty and boldness for argument, where the book is often thin and wanting. McFate can often seem out of his depth when the purpose is prescriptive, because the arguments offered for the new rules trade on hasty generalizations and the rhetorical power of the original questions that lead McFate to the rule in the first place. This often does not stand up to a critical light. We can agree with McFate on the sickness; we should wonder if the offered cure is snake oil. I found some problems common to the literature on strategy and national defense lurking in these chapters. McFate’s presentation of Clausewitz and Sun-Tzu is often tendentious. He is not careful with terms and often conflates concepts between rules. For example, McFate’s use of tactics, operations, strategy, and grand strategy can often refer to different concepts at different times. Finally, he invokes a familiar realist rhetorical flourish, explicitly distancing himself from moral and legal questions because they are “charming and ineffectual” while implicitly invoking moral arguments and international law when it suits his ends. This last foul also raises concerns about McFate’s scholarship, at least in the areas where I have standing to make such claims. The only referenced source in his discussion of the international law of armed conflict was written in the 19th Century. This is akin to making a physics argument that contravenes Einstein by quoting Newton. One gets the sense of similar slights of hand in the fields of history, economics, and psychology. Any time McFate wanders from his primary fields, the charm grates, and the polemic strikes the reader as bombastic. Of more consequence, however, McFate’s prescriptive arguments trade on at least three controversial assumptions and lack coherence across the ten rules. First is the assumption the West is facing an existential fight it is already losing. McFate’s discussion of Rule 3, that there is no distinction between war and peace, extolls China’s “Three Warfares” strategy and the capabilities of the Chinese. McFate offers little evidence, however, of what existential threats China might actually pose to the West. McFate’s quip that those who grasp his third rule will “conquer, like China, and those who don’t will speak Chinese” clearly trades on an existential threat when what is happening in the South China Sea is a struggle over regional hegemony and economic primacy. One might agree with McFate that being second or third in this region to China is concerning, but that this is an existential threat to the West is not clear. The second assumption is that the West’s adversaries created the durable disorder and suffer no ill-effects thereby. McFate assumes the leaders of the West’s adversaries hold a near flawless grip on the strings of power and the conditions of the disorder. Here, McFate follows others in reading every action of Vladimir Putin or Xi Jinping as an intentional master-stroke and every action under the flag of Russia and China as a direct result of the leader’s will. Such a picture of the internal politics of Russia and China strains credulity. Applying this assumption to actors like narco-terror networks seems flatly false. Third is the assumption that the only way to deal with the durable disorder is to learn how to fight within it. The dominant theme of McFate’s ten rules is to learn how to beat those already succeeding in the durable disorder at their own game. There is some merit in this approach, and McFate’s rules are a good place to start. However, one might also look for ways to alleviate conditions like poverty and famine that make these approaches successful and disorder so durable. These three assumptions are common within this literature, and here McFate is toeing the conventional line without offering good reasons for doing so. These assumptions are contentious, at least, and could lead to problems. It often seems McFate is yearning to read the geopolitics of 1939 into the durable disorder while paying little attention to the relevance of 1914 as an equally relevant historical comparison. Finally, even if we grant their truth, the ten rules do not offer a coherent set of beliefs or prescriptions. Two examples will make this sufficiently clear. Rule 4, “Hearts and Minds Do Not Matter,” conflicts with Rule 5, “The Best Weapons Do Not Fire Bullets.” The lesson McFate would have us learn from Rule 4 is that success in counter-insurgency warfare requires eliminating insurgencies by killing insurgents. The lesson we are to learn from Rule 5 is that killing people in modern war is largely irrelevant to the victory we would like to win. But both these rules cannot be true at the same time. Killing either matters to victory, or it doesn’t. A second example is that Rule 1, “Conventional War is Dead,” and Rule 2, “Technology Will Not Save Us,” tend to contradict the later rules concerning the return of mercenaries and the rise of non-state military powers. This is because these non-state powers threaten international order precisely because they possess at least a modicum of conventional military power and technology. It is at least inconsistent to deride Western states as technophiles while also claiming these states are ignoring a burgeoning technological rival in private military companies. The surprisingly conventional assumptions and conceptual conflicts within the rules obscure McFate’s novel and bold suggestions. He has many interesting ideas that suffer from overly brief discussions but have merit whether or not one agrees with his ten rules. The highlights here are McFate’s review of the merits of an American force patterned after the French Foreign Legion, the fungibility of coercive power in the durable disorder, and his discussion of the long history of dealing with commodified mercenary war through supply, demand, and the market. McFate’s ten rules offer insight that clears the ground and focuses the reader on novel and important problems. For this reason, the book is worth the time. His solutions to these problems are bold, but, one wants to hear more in their defense than he manages to offer. A critical reader might also find inspiration here. As McFate presents them, however, the new rules are a starting point and far from the last word on victory or how to get there. Bob Underwood is a U.S. Army officer and a Fellow in its Advanced Strategic Plans and Policy Program. He is pursuing a DPhil in Philosophy at the University of Oxford. The opinions expressed here are his own and do not reflect the official position of the U.S. Army, the Department of Defense, or the U.S. Government. It is best to consider McFate’s book alongside some of his cited allies and targets. Cf. Lawrence Freedman, Strategy: A History, Second ed. (New York: Oxford University Press, 2015); Hew Strachan, The Direction of War: Contemporary Strategy in Historical Perspective (Cambridge: Cambridge University Press, 2013); P. W. Singer and August Cole, Ghost Fleet (London: Canelo, 2015); P. W. Singer, Wired for War: The Robotics Revolution and Conflict in the Twenty-First Century (New York: Penguin Press, 2009); Christopher Coker, Future War (Cambridge: Polity, 2015). He brackets these questions as “charming and ineffectual” on page 17, then invokes moral arguments and laments China’s expert use of “Lawfare” often. Cf. Ibid. Pg. 17, 103, 135.